The first database in Rosen’s Core Concepts suite makes complex scientific concepts easy to understand and highly engaging. The intuitive, interactive interface encourages hands-on exploration to develop a deep understanding of the 118 elements that make up our world. This resource supports STEM learning and immerses learners in the building blocks of each element, their discoveries and uses throughout history, and much more. PRICE QUOTE » Already subscribed? 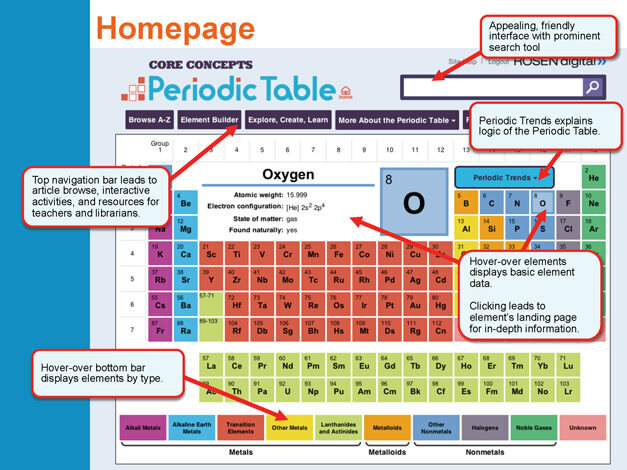 An ideal database for young researchers...the amount of text beyond the property stats and the clean, uncluttered ease of access are the elements that place Core Concepts: Periodic Table at the head of the pack.